Okay, if you live outside the United States, this one might be lost on you. Let us explain. 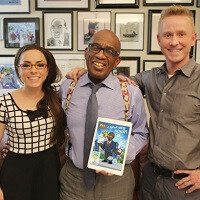 Al Roker is a weatherman. That’s it. In fact, he isn’t even a full-fledged meteorologist, he is just a New York based weather presenter and has been with NBC since the early 1980s. With such tenure, Roker has become a fixture in certain parts of American society and for anyone that has watched any amount of morning television, there is a good chance you have seen his face or heard his voice. He has been so reliable over his decades-long career that it made national news (no we are not making that up) over the one time he overslept and missed his morning show on The Weather Channel. There is not much left for Al to do with his career except have an iOS (iPhone and iPad supported) game named after him. Al’s Weather Rokies. That’s what you are if you sign on to play the game, a "Rokie," and your task, as a Rokie, is to match the Rokie icons in Al’s weather dreams so you can wake him up in time for work. Okay, it may sound a little corny, but one cool thing about that app is that it incorporates local weather forecasts into the gameplay. It has a couple different worlds to work with, and 10 levels of play for each. At least you will find out if you need to bring an umbrella with you when you play. The game is 99-cents in iTunes which is source linked below…Rokie.